I hope we get more shots of this model now that the cat's out of the bag. Фишка в том, что на нижней картинке таки не Армата, а... незнамо что! Note also the cannon... presumably 30mm mounted in the side of the turret that presumably can be used against a range of targets too. An interesting aspect of the high elevation of the main gun would be that missiles should be able to be lofted to much greater distances making fire and forget diving top attack missiles much more useful and capable. The sustantial elevation can be useful in indirect fire. The large caliber gun of the tank must be intended to be used as indirect artillery.Krasnapol type guded projectiles come also into mind. The side gun is mentioned to be a 45 mm. Indeed, very useful against a whole range of armoured and unarmoured targets. This gun is initially a 125mm high velocity smoothbore gun, and later to be a 152mm smoothbore high velocity gun. The MBT version that this vehicle is will not be equipped to engage targets with its main gun indirectly. The high elevation will be useful in hilly country on reverse slopes and aiming at targets well above or below your tank... including in urban areas. It will be point and shoot and visible targets... it wont be used against indirect targets. The brigade will already have tube and rocket artillery for that sort of job and those assets will be equipped and trained to engage indirect targets very very effectively... in fact more effectively than any previous Russian unit. It is an unusually short barrel for a 45mm weapon. Look at the barrel length of the guns on the Kurgan and Boomerang vehicles. The long barrel with muzzle brakes will be either 45 or 57mm and that will be the turret fitted to all Russian IFVs, including armata, and the sensors and electronics will be the same as well. If the extra gun on the Armata or tank vehicle is a 45mm then I suspect it is not related to the gun on the IFVs and is a lower velocity weapon, perhaps with a custom designed HE shell for dealing with infantry or obstacles with a small stub propellent charge like the 100mm gun of the BMP-3. The secondary weapon system is either a short barreled 45mm cannon built to shoot HE, or a long barreled 40mm grenade launcher. There also may be a second cannon/grenade launcher in the same place on the other side of the turret but the camera angle is hiding it. Where is Armata I dont see it , Gur Khan said there was no Armata there. 45mm is a strange calibre to use. They were working on a 45mm calibre weapon as a main gun but that was a very high velocity weapon designed to penetrate IFVs from 2,000m and tanks from the sides and rear sort of weapon. It was competing with the 57mm weapon based on a modernised S-60 system. I rather suspect that such a weapon would be an independently elevating 40mm grenade launcher like a Balkan with a longer barrel for increased muzzle velocity for longer range and higher flight speed so the round gets to targets faster. It would still be a relatively low velocity weapon rather than a cannon, but that is OK because low velocity ammo is smaller and you can carry more, and a low velocity round compliments the very high velocity main gun rounds. Armata is a concept... just like the "replacement AK" is a concept, for which Izhmash is putting forward AK12s and KBP will likely put forward ADS and AEK will put forward an improved model of their weapon and Nikonov will likely put forward a modification of his An-94. Also like the replacement AK we are talking about a family of rifles perhaps from SMG right up to belt fed light machine gun, and the armata is the same... it will perform every function within a heavy brigade from recon through to air defence and troop transport and gun platform fire support and everything in between. Even the engineer vehicles and recovery vehicles will be armata based. The model in the photo in post 71 on this thread by Zivo shows a tracked chassis with a turret and a large calibre 125mm gun and tank level armour. In other photos there is a similar 125mm gun mount... though without the extra guns I assume... (unless they fully retract) on a kurganets-25 vehicle. I rather suspect all sorts of extras on the tank turret that include Shtora 2 and Arena 2 and RWS and or course all sorts of sensors and optics that don't seem to be present on the model of the Kurganets-25 MBT model. Think of these as base models. One of the photos we talked about shows Boomerang-25 and Kurganets-25 with 120mm mortar turrets and 45/57mm guns, which we can assume are mortar carrier turret and IFV models, so there will be armata mortar carriers and armata IFVs as well. As mentioned but not clearly visible in the photos down the far end of the picture were Bereg like 152mm guns mounted on trucks presumably for coastal defence, and the same turret mounted on a tank chassis. This latter is Koalition, which is an Armata based vehicle. Because of the size and weight of the turret, which is unmanned but includes a dual belt feed 152mm artillery gun will be too heavy for Kurganets-25 or Boomerang-25/-10, so I suspect only heavy brigades will have 152mm Koalition, and that the medium brigades might have a lightened shorter range 152mm gun, and light brigades might have rocket equipped vehicles perhaps for mobility and firepower. Gur khan might be saying that this model does not represent the UVZ armata vehicle. These vehicles are in model form and might be being used to give the visiting politicians an idea of the concept of what they makers are talking about. I rather doubt the final IFV turrets will look like that either... there are no panoramic sights, no obvious ERA... no RWS... etc etc. I wont make out much from the partially seen turret and chassis of the prospective tank and call it Armata or related to it , it could be easily be many of the concept tank that these design bureau work on and could have been demonstrated. You have to keep in mind the standardisation... the electronics and systems and turret of the armata "tank" vehicle will be the same as the electronics and systems and turret of the Kurganets-25 and boomerang-25 and boomerang-10. There might be minor variations in armament like the tank vehicle for the armata might eventually have a 152mm smoothbore gun, whereas the boomerang-10 might be too light for such a powerful gun and might get the special 125mm gun from the Sprut and be a 6 wheel 16 ton vehicle with a big gun. There is not likely to be too much variation for the armata design... after all it is a tank level armoured vehicle with an engine in the rear, an unmanned turret in the centre and three crew under very thick very heavily sloped armour at the front. The simple low profile turret on the Kurganets-25 model makes a lot of sense as it is a very small target that would need little protection, but I rather suspect it is missing a lot of stuff including sights and sensors that they clearly want to keep secret for now. Note the turrets for the IFVs don't have any obvious APS system, and nor do they have ATGM launchers which I would expect they would have at least Kornet-EM launchers fitted as standard and probably a 30 cal MG and perhaps grenade launcher like upgraded BMP-2s. I would expect to be impressed when we see full sized products in metal... the T-90AM impressed me once I understood all the design decisions they made, and I expect at least the same for Armata et al. Better photo of the model tank (Armata??) shown to D. Rogozin at the Motovilika plant in Perm a few days ago. 1)There are 2 weapons (guns/machine guns/grenade launchers on both sides of the turret. 2) there is some sort of flat area at the back of the turret. 3) there are at least 2 crewmembers sitting in the hull. The third member may be also in the hull or under the turret or in the turret. What is written on the Russian Plaque ? Does it say Armata ? I can barely read the last line which says: Chassis "Armata"
Some comments looking at the picture. The Flat Area behind the Turret will likely have ammo with autoloader or just space for ammo. The third crew is likely to be at the back of turret or inside the turret , I suspect they will completely isolate the crew turret. For all we know this could be 2 man crew Tank. Hmmm, the panel does say Armata, wtf? Gur Khan is a reliable source on this, wonder what he has to say. Looks pretty good otherwise, most of the turret (aside from space for gun mechanism) looks very low and thick, question is is it completely unammed or as it like the rumors I have heard, unmanned but has space inside for people to operate in case of emergency. Not sure how I feel about those secondary guns, wait and see what the final config is I guess. That is one beautiful killing machine. I cannot wait to see the production model. Supposedly a "storming tank", not MBT. 120mm rifled gun? Is this like Vena on an armata chassis? I see this as a BMPT replacement, one that is rather closely unified to Armata MBT. 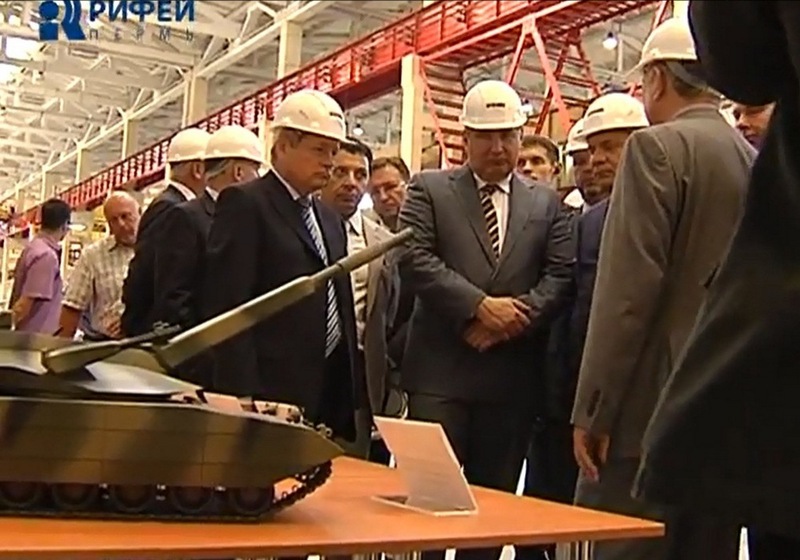 The tablet in front of it says "Combat Artillery Platform on the Armata Chassis". Almost looks like the gun itself has armor around it. Can't wait till next year when the metal rolls out! Alexey Khlopotov thinks our mystery auxiliary weapon is a remote controlled 6 barreled machine gun. Looks like it is in the higher res photos. A tank sized vehicle would be part of the Armata family... but this could be the Fire support vehicle that could be used in situations where a tank is not suitable, like convoy protection or tank protection in urban areas. there are at least 2 crewmembers sitting in the hull. The third member may be also in the hull or under the turret or in the turret. The Turret will contain ammo and will not have any crew in it. Likely the three crew are seated beneath the turret overhang to protect them from top attack weapons. There is no point in putting crew in the turret. I would expect the flat area behind the turret contains the autoloading mechanism and space for a few rounds of different types ready to be loaded rapidly into the gun. The majority of rounds will be stored inside the turret below the turret ring safe from direct fire threats. I would also expect space below the turret ring will contain 30mm cannon shells and 40mm grenades for the 30mm gatling and long barrel 40mm grenade launcher. I would think a twin barrel 30mm cannon would have been more use than a 6 barrel gatling. APS will not involve the guns. It will likely consist of munitions that can be launched based on signals from the TI/Radar and other sensors. Technically armata is a program name for a family of vehicles. This could be the armata BMPT, or it could be from a rival company to UVZ and is a tank armata vehicle. This could be a break through... the 100mm gun of the BMP-3 is a rifled weapon with a small charge and a large payload but its max range is 7km. The 120mm mortar/gun of the Vena has a max range of something like 13km and can fire both shells and mortar bombs and use bagged propellent charges so for close targets it can use one propellent bag so it doesn't go high up into the air and remain in the air for a long time before coming down on target... much like a mortar or howitzer. This makes the weapon much more effective and much more accurate and versatile. Developing a new 120mm rifled gun/mortar would be ideal for a BMPT like vehicle as the high elevation and raw HE power means even tough hillside bunkers can be taken out with cheap ammo. It would be able to use 120mm mortar shells and 120mm shells from NONA etc, and also 120mm laser guided missiles and it will probably have its own standard HE round for general targets that will be much more compact than high velocity rounds of smaller calibre. It does, but I hope they see sense and change it for a GSh-30K as fitted to the Hind. A shorter barrel model is fitted to the Su-25. The GSh-30K has longer barrels for a higher muzzle velocity and it has a muzzle brake, and also fires at a slightly lower rate than the GSh-30 fitted to the Su-25. The extra length and weight of the GSh-30K is not a problem on a ground vehicle, and it is much lighter. than the 6 barrel GSh-6-30. Of course it could be a GSh-23-6. The GSh-30 fires at 3,000 rpm and the gun weighs 105kgs. It is not a gatling so there is no wind up period to get to full rate of fire and is apparently very accurate. It has a muzzle velocity with standard ammo of 870m/s. It is used by the Su-25 and uses standard 30 x 165mm ammo. The GSh-30K is used on the Mi-24P in a fixed position on the side of the helo and has longer barrels and a muzzle flash hider. It weighs 126kgs and is not a gatling so there is no wind up period to get to full rate of fire and is also apparently pretty accurate. The GSh-30K can fire at two rates, 2,000-2,600rpm in high rate, and 300-400rpm in low rate... the latter allowing single shots or short bursts. The muzzle velocity is 940m/s using standard 30 x 165mm ammo. As you can see the GSh-30K is the heaviest, but the choice of rate of fire means it will be useful against both ground and air targets. As a comparison the GSh-6-30 fires at 6,000rpm, and is a gas powered gatling so there is no electric motor and it winds up very rapidly. It would take a dozen or more dud rounds in a row to effect performance and single dud would be cycled by momentum even if they don't fire (such reliability is important in remote weapons as in aircraft or in armata as a crewman wont be able to reach back and recock and continue firing). The Russians do have a set of pyrotechnic charges that burns through the side of a 30mm shell case to ignite the powder charge directly to fire rounds with dud primers. At 149kgs it is the heaviest gun option and the enormous rate of fire would be wasted on most ground targets... having said that a single gun would put out shells faster than Shilka or Tunguska and would be devastating. The GSh-6-30 was carried by the Mig-27 and the Su-24. The other option could be the GSh-6-23M, which fires at up to 10,000 rpm with a muzzle velocity of 715m/s with a 23 x 114mm cartridge... the weapon weighs an amazing 73kgs and would be devastating, though the rate of fire would be high the compact ammo could be carried in larger volumes than the much larger and heavier 30mm rounds. The middle one (I marked it with the green arrow) is for the driver sitting in the center. The sets of three (I circled them with red and yellow ovals) are for the gunner and commander. The gunner and commander need a more peripheric vision. A forward only sight is sufficient for the driver. With that configuartion, the 3 crewmembers are sitting almost right underneath the front part of the turret which is the most heavily armoured part. Exit from the vehicle is done through the two hatches forward of the sights (not very visible on this enlarged photo, but quite visible on the regular size photo). But the new design from Omsk which is a BMPT class will have similar unmanned turret.